Polar 3D, Pie Partnership Teaches Students 3D Modeling and Prototyping: Engineers, designers, and scientists think and work in 3D, and Partnership For Innovation in Education (PIE) has teamed up with Cincinnati-based Polar 3D to create their ideas and solutions in a three-dimensional design format. “Through this collaboration, PIE is able to partner with Greater Cincinnati’s leading manufacturers, engineers and product designers to take our Science Technology Engineering Math (STEM) curriculum to another level, offering students and educators a chance to use the design thinking process, develop a set of 3D prototypes and choose the solution which best solves the business challenge. This is the newest opportunity bridging the 21st century classroom with business, arts and engineering leaders who are constantly seeking future employees who can identify, test and develop workable solutions. 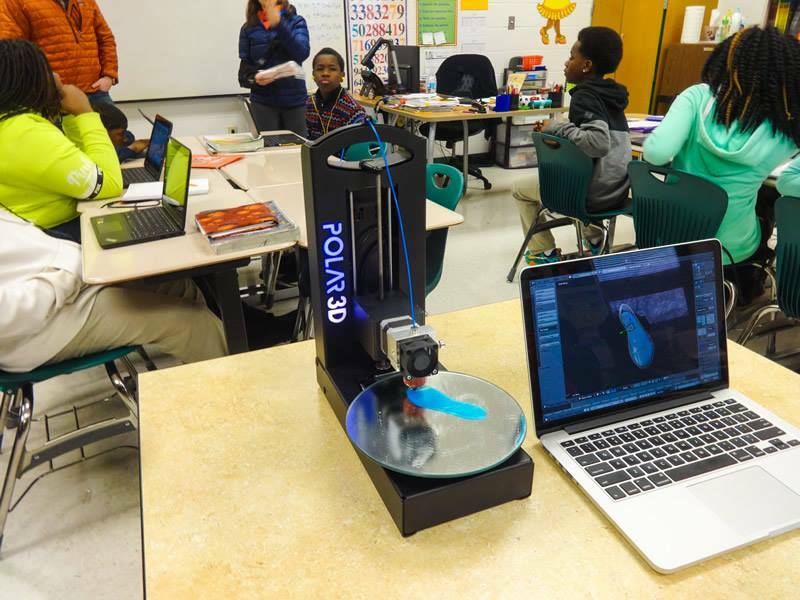 Embedding 3D prototyping into our curriculum is just another way to prepare students for that future,” said Mary Welsh Schlueter, CEO for PIE. Polar 3D, manufacturer of the first affordable, practical 3D printing solution for homes, schools and colleges, will provide the expertise and resources to guide teachers and students through the entire 3D printing process from coding to modeling to prototyping so students can produce a physical product of their idea, whether it is a new toy or a simple household gadget helping to make everyday activities easier. PIE students recently worked with the Cincinnati Ballet to design a more ergonomic ballet shoe. “Just imagine, PIE students will not only create and design a better ballet shoe but also bring it out of the computer screen into their own hands and be able to refine their design all while gaining a better understanding of the creation process," said Ed Estes, Polar 3D co-founder. "And after the ballet shoe? Hopefully it will inspire these young minds to think like entrepreneurs and create something that will change everyone's future." This new curriculum will be incorporated into PIE’s case-based learning tools for Greater Cincinnati students with the opportunity to scale the program throughout the United States. Currently, PIE is the global leader in developing “deeper learning” curriculum using case-based, design thinking, and 3D modeling learning skill sets typically used in graduate and undergraduate engineering, design, law, business, medical and applied technology programs. “This partnership truly allows students to direct their learning and put themselves in the role of engineer, designer and problem-solver. Experiences like this empower students to envision future career pathways and help them apply what they are learning in the classroom to real-life scenarios,” said Dr. David Rosenthal, retired professor of marketing at Miami University Farmer School of Business, who has served as both president of the North American Case Research Association and as editor of the Case Research Journal. Partnership For Innovation In Education (PIE) develops transformational educational tools preparing the 21st-century workforce for success in the global marketplace. PIE features first-ever career simulation and mentoring alliances with business, education and arts organizations, providing hands-on learning in the K-16 classroom. PIE is a 501c3 nonprofit, tax-exempt organization, awarded the GuideStar Nonprofit “Gold Exchange” Ranking and is an Ohio School District Partner. For more information, visit www.piemedia.org or follow @PIE_Innovation on Twitter. Partnership for Innovation in Education (PIE) received ArtsWave Grant for “Build a Better Ballet Shoe”, and is teaming up with Polar 3D and Hays-Porter Elementary School to give its students the opportunity to use their problem-solving and decision-making skills to design an ergonomically better ballet shoe through a new STEAM (Science Technology Engineering Art Math) case learning opportunity. The Build a Better Ballet Shoe program was developed by Partnership for Innovation in Education (PIE) along with its case partners: the Cincinnati Ballet, Cincinnati Dancewear, Wellington Orthopaedic & Sports Medicine, Stages for Youth and Cincinnati Public Schools. ArtsWave has awarded PIE a $10,975.00 grant to help fund the development and implementation of this innovative program.